Sebaceous lymphadenoma of salivary glands has a very rare incidence to our knowledge. It is a benign tumor accounting for only 0.196% of all adenomas of the parotid gland. 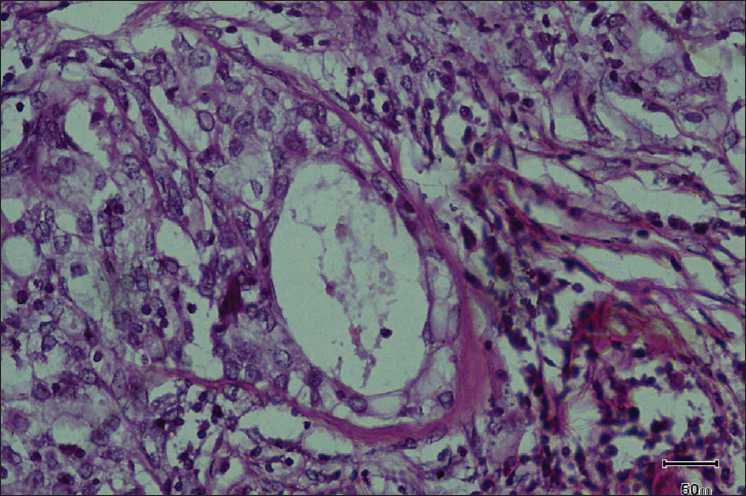 There are many possible theories in support of its uncertain histogenesis. 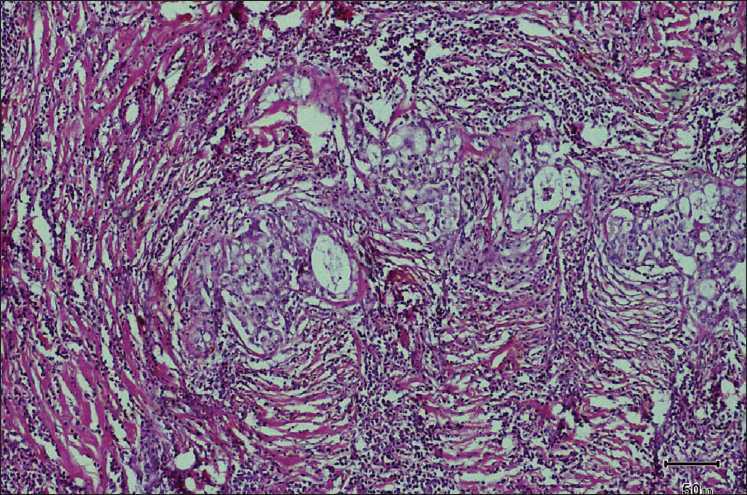 Diagnosis can be established by histopathological evaluation. The tumor has a benign course, unless there is a synchronous association with an aggressive malignant neoplasm. A 37-year-old female presented with a slow-growing left-sided parotid swelling of 1-year duration. 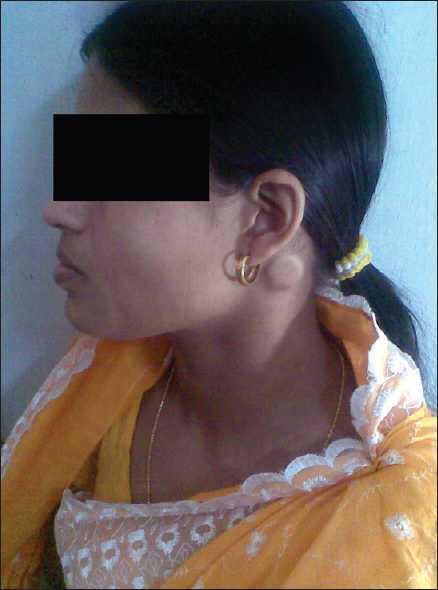 Clinical examination revealed the presence of a solitary nontender lump in the tail of the leftparotid gland, which was soft and mobile, without any attachment to the overlying skin [Figure 1]. Figure 1: Solitary lump in the tail of the left parotid gland, measuring 2.5 cm in diameter. A surgical excision was done based on aspiration cytology finding suggestive of benign sebaceous neoplasm. Operative findings revealed that the mass was well defined, without any infiltration into the surrounding tissue; facial nerve was intact. Grossly, the excised mass was well-circumscribed, globular, tan-yellow, measuring 2.5×2×1 cm [Figure 2]. Cut section was solid, homogenous. Multiple sections studied with conventional hematoxylin and eosin (H and E) staining revealed sebaceous islands, surrounded by lymphoid stroma with reactive follicles [Figure 3]. Duct-like structures lined by flattened epithelium were also seen [Figure 4]. This was distinguished from its other histological mimics like Warthin's tumor, mucoepidermoid carcinoma, sebaceous lymphadenocarcinoma, and sebaceous lymphomas without sebaceous differentiation. A final diagnosis of sebaceous lymphadenoma was given. 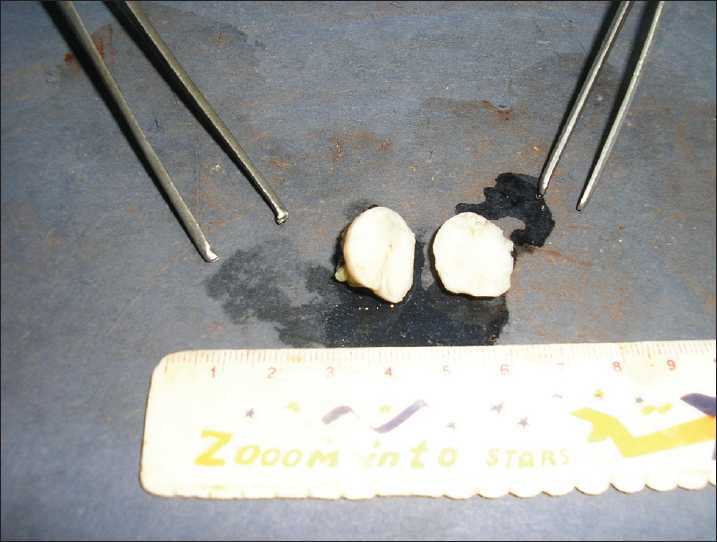 Figure 2: Gross photograph showing well-circumscribed, globular, tan-yellow, mass measuring 2.5×2×1cm. Cut section was solid and homogenous. Figure 3: Photomicrograph showing lobules of sebaceous cells over a lymphoid stroma (H and E, ×100). Figure 4: Photomicrograph showing dilated duct lined by flattened epithelium (H and E, ×400). The main differential diagnoses to be considered are low-grade mucoepidermoid carcinoma, sebaceous lymphadeno-carcinoma, sebaceous lymphomas without sebaceous differentiation, and Papillary Cystadenoma Lymphomatosum (PCL). Low-grade mucoepidermoid carcinoma can be distinguished by the presence of uniform size and distribution of epithelial islands, cystic spaces, salivary duct like structures, clear or intermediate cell differentiation, and more readily identifi-able mucin. In sebaceous lymphadenomas, mucin, if present, is restricted to the duct-like cells only, and lymphoid proliferation is characteristic. Warthin's tumor can be easily diagnosed by the presence of cysts lined by oncocytic cells (unlike sebaceous lymphadenoma) surrounded by a lymphocyte-rich stroma. Lymphoepithelial sialadenitis can also come as a differential diagnosis; however, it can be ruled out by the absence of sebaceous islands and atrophic ducts. Other malignant tumors like sebaceous lymphadenocarcinoma and sebaceous lymphomas without sebaceous differentiation can be ruled out by the history and slow progress of this tumor. The peculiarity of this tumor is its synchronous occurrence with other tumors, which brings up variability in the biologic behavior. Tumors that can occur synchronously with sebaceous lymphadenoma include Warthin's tumor, pleomorphic adenoma, oncocytoma, acinic cell carcinoma, and basal cell adenomas. Shukla et al. have reported a case of squamous cell carcinoma associated with this tumor. Maffini et al. have described a case of sebaceous lymphadenoma diagnosed synchronously with invasive-duct carcinoma of the breast. 1. Kuhn U, Kohler HH, Jecker P. Rare tumors of the parotid gland. Lymphadenoma of a sebaceous gland and extracranial metastasis from gliobastoma. HNO 2003;51:417-20. 2. Shukla M, Panicker S. Synchronous sebaceous lymphadenoma with squamous cell carcinoma- case report. World J Surg Oncol 2003;1:30. 3. Majeed M, Murray B, Hume W, Makura Z. Sebaceous lymphadenoma of the parotid gland. Dentomaxillofac Radiol 2008;37:300-4. 4. Seiichero N, Yukinori A. A Case Report of Sebaceous Lymphadenoma. J Oral Pathol Med 2002;31:242-3. 5. Gnepp DR, Brannon R. Sebaceouus neoplasms of salivary gland origin. Report of 21 cases. Cancer 1984;53:2155-70. 6. Chandrashekhar T, Ramani P, Anuja N, Karthikeyan R, Abhilash PR, Narayan V, et al. Unilocular cystic sebaceous lymphadenoma: A rare tumor. Ann R Coll Surg Engl 2007;89:1-3. 7. Rund CR, Spies JA. A neck mass in a 57-Year-Old Man. Arch Path Lab Med 2004;129:e171-2. 8. Maffini F, Fassani R, Peterella D, Maiorano E, Bruschinif R, Pelosi G, et al. Sebaceous Lymphadenoma of salivary gland: A case report and a review of the literature. Acta Otorhinolaryngologica Italica 2007;27:147-50.